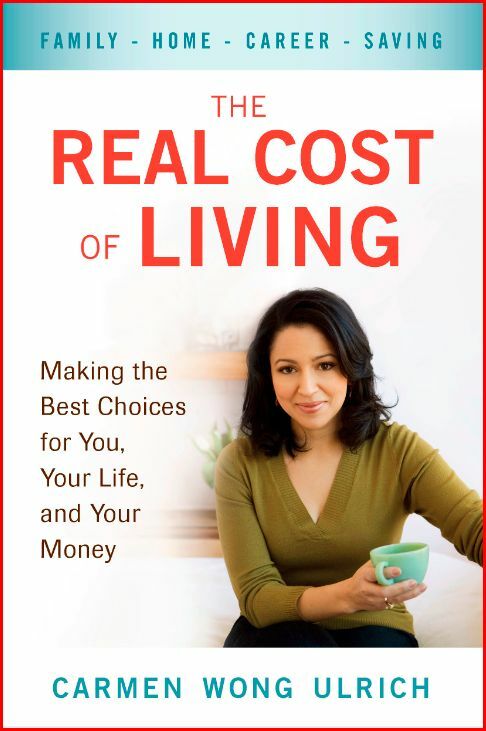 A couple of weeks ago, I (Dawn) saw The Real Cost of Living by Carmen Wong Ulrich recommended over at The Simple Dollar. I decided to pick it up from the library, and I’m glad I did! The Real Cost of Living is a great read. Ulrich takes a look at many different aspects of people’s lives. Each chapter looks at the potential costs and benefits of the life changing decisions people make every day (buying a home, getting married or divorced, having a family, etc.). Ulrich examines each decision, and discusses what the impact could be on your life both financially and personally. Ulrich’s point is that many financial decisions have an impact on your personal life, and many personal decisions have an impact on your financial life. So, you must examine the costs and benefits on each side before making a decision to move forward. The reason I like this book so much is that I completely agree with this concept. When making financial decisions, people often don’t consider how it will affect their personal lives. We see that a lot in financial planning. Just because a decision may make sense for you financially, doesn’t mean that it’s the right decision for your life. An example in the book is buying a home. If you are a person who would not enjoy putting the time and effort into maintaining a home for any reason, and feel buying a home would just cause you unnecessary stress and headaches, don’t do it! Even if you could easily afford to buy a home and it may make financial sense for you to do so, if you don’t think it’s the right decision in your personal life, it would only make you unhappy. The same is true for your personal life. If there is something that you feel you need to do to be fulfilled in your personal life that may not be smart financially, it still may be worth doing. An example from the book (and one many people experience in their own lives!) is having children. You may never feel financially ready to have children, but if it’s something you need to do for yourself personally, it may be the right decision. The Real Cost of Living is not a specific financial plan, but it can really make you think about how different things can affect your life. It’s a quick, easy read, and one that I would definitely recommend! Here is September’s review of blog posts. We hope you find something you enjoy! Get Rich Slowly – Want More Money in Retirement? Work a Little Longer! – The longer you work past age 62, the better off you’ll be, both in your own portfolios and in your Social Security benefit. Good Financial Cents – Is It Better to Lease or Buy a Car? – When it comes time to replace your current car, which option is right for you? The Simple Dollar – Frugality Won’t Make You Rich – Frugality itself won’t make you rich, but it can help you do the things necessary to becoming rich. The Simple Dollar – What Are Your Priorities? – Do you often find yourself regretting putting something ahead of your top priorities? As promised, here is our first detailed post about our book recommendation The Automatic Millionaire by David Bach. As we said last week, The Automatic Millionaire is not a get rich quick scheme, or a financial plan that requires a lot of time and money. Bach outlines a simple plan that can help people at any income level become millionaires over the course of their career by making some easy decisions about money. Bach’s “Latte Factor” is likely something we’re all familiar with. It battles the myth that you must make more money in order to be rich. What if you could save $3.50 a day? That’s $1,277.50 a year in savings, not including the affect of compound interest on that money. Think you can’t afford $3.50 a day? How about more? The “Latte Factor” shows you where you can afford to make adjustment to your spending. Obviously, the idea is that if you get your coffee elsewhere (home or work), you can save about $3.50 a day by not stopping on your way to work for a latte at the coffee shop. But it doesn’t have to be a latte. The idea is that once you examine your spending, you will likely find some way you spend money daily that you can live without. Maybe it’s $3.50, maybe it’s $10.00, maybe even more. The next step in becoming an “Automatic Millionaire” is to “Pay Yourself First.” Basically, this means when you get your paycheck before you pay anything else, pay yourself first by putting money aside for your future. Sounds easy, but this is likely where many people fail. It’s much too easy to come up with reasons and excuses why you can’t save. You have bills to pay and situations always come up that require money. Then you find yourself strapped for cash, waiting for your next paycheck, and somehow no money ended up in your savings. However, Bach believes Paying Yourself First is the most important step to becoming a millionaire. No, excuses, Pay Yourself First, and then your other financial commitments become secondary. Paying Yourself First becomes more difficult when your paycheck has taxes automatically taken from it before you even see the money. However, if you have the option of a pre-tax retirement plan (401(K) or 403(B)) which can be funded by dollars directly deducted from your paycheck, then setting up automatic savings into this type of account is a way to Pay Yourself First before the government. If not, you can look into pre-tax accounts like a Traditional IRA to help Pay Yourself First. If you are unable to participate in a pre-tax account, at the very least Pay Yourself First by funding an after-tax account the day after you receive your paycheck and before other bills are paid. However you want to handle it, Paying Yourself First is the most important step you can take. Savings then become a reality instead of something that you’ll do some day when you can afford it. Even if you just follow these two steps, you will be on solid footing for your future. However, Bach adds another step: “Make it Automatic.” To avoid the need to spend excessive amounts of time and the need for a lot of discipline, making your finances “automatic” will help simplify the process and help ensure that it continues. We’ll discuss this step next week. We’re sorry we missed last Wednesday’s scheduled book review! Things were a little hectic last week for us, and we just couldn’t put the time in that was needed to make a post. So, we’re doing our book recommendation today instead. 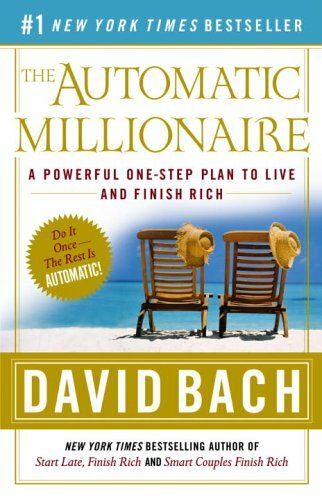 The Automatic Millionaire by David Bach had such great ideas that we wanted to write about them in some more detail over the next few weeks. Although the title makes it sound like it might be a “get rich quick” type book, it’s actually the opposite. David Bach puts forth a plan on how you can become a millionaire over the course of your working career without needing to make six figures or spending large amounts of time and energy on your finances. He claims that anyone can become a millionaire with the right lifestyle adjustments and by making your finances automatic. Being “automatic” means that you don’t have to think or do anything for it to happen. Also, if it’s automatic, you won’t have a chance to come up with excuses as to why you can’t afford it. So, automatically having your 401(K) funded out of your paycheck is an example of this. If you had to remember to do something every two weeks for this to happen, would you? Likely not, most people don’t have the discipline to handle their finances like that. That’s where The Automatic Millionaire comes in. Bach outlines some steps you can take to become an “automatic millionaire.” We will be outlining some of our favorite ideas in the weeks to come. Like with most books, we don’t agree with everything outlined. However, we think that The Automatic Millionaire is worth reading, especially if you still have a number of working years ahead of you.